Zero Waste Oxford, Miami's newest student organization, is focused on both reducing waste on Miami's campus and around the greater Oxford area. 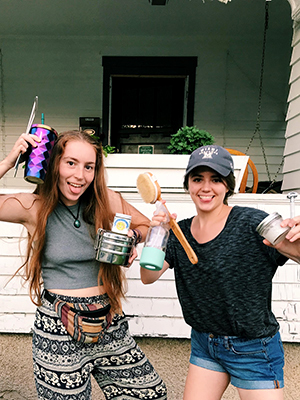 Founded by seniors Katja Diekgers and Madison Olds, Zero Waste also raises awareness on how college students can live a more sustainable lifestyle. Diekgers and Olds show some of the zero-waste products they use. Diekgers is a zoology and environmental studies double major with an individualized studies minor, and Olds is a psychology major with minors in both sociology and individualized studies. Individualized studies, which allows students to design their own major or minor, is housed at Miami's Western Program. "I think we both were just eager to create our own academic pathway and ultimately have the freedom to choose the courses we were passionate about," said Diekgers. They also wanted to learn from the helpful and impactful Western Program faculty, including the program director, Nicholas Money, who also serves as the faculty advisor for Zero Waste Oxford. In an article published by Miami's student-run environmental publication, Greenhawks Media, freshman writer Naiyi Jiang discussed the mission of this new organization: "Their goal is to end single-use plastics in Oxford, Ohio and reduce waste to save our planet. They want to tell people how to become more sustainable because they notice some people are apathetic to the problems that Earth and other species are facing." While the main goal of Zero Waste Oxford is to encourage the reduction of waste on campus and around town, its two founders also wanted to increase overall awareness. "Miami is not one of the most sustainable campuses we've seen when it comes to waste, and we want to encourage individuals to become informed on simple ways they can help the campus and Oxford reduce their carbon footprint," said Olds. Diekgers and Olds have large-scale goals for where they plan to take the organization this semester, but they are currently excited about their event coming up on February 10-16. Zero Waste Oxford will be hosting their first ever Pop-Up Thrift Shop on campus, in the Armstrong Student Center near Lux Cafe. After attending a zero waste conference in Philadelphia, Diekgers and Olds learned about the concept of student-run thrift shops on campus from other attendees. Their ultimate goal is to create a permanent thrift store on campus, where the profits would go towards student scholarships. "For now, the profits of this event will be going towards hosting Bea Johnson, a popular keynote speaker on topics of zero waste and sustainability," said Diekgers. This pop-up event will feature clothing items donated by other Miami students and faculty. They will be accepting payment forms such as MULAA, credit cards, and cash. Clothing donations for the event can also be made anytime at the 39’84” Center in the basement of Peabody Hall or at 201 S. Main. The Zero Waste Oxford organization is nearly a year old, and is still accepting and welcoming new members at all times. Some upcoming projects that members would be able to participate in include weekly trash pick-ups around campus and Oxford, working on future thrift shops and also the implementation of a potential composting pilot project in Peabody Hall. If you're interested in the organization, please contact zerowasteoxford@gmail.com.